In yesterday’s class, we viewed the shows Decoy and Hazel. While these two shows present to us very different lives of women in the workplace, the underlying message appeared to be the same. The message I picked up from both shows is that women in the 1950’s and 60’s were not afforded the opportunity to hold equal jobs as men and even if they were afforded an equal opportunity, they were utilized in an unequal manner. I would like to draw on our class discussion yesterday, where we discussed that in that period of time a lot women found jobs that entailed the same kind of work as being a homemaker. 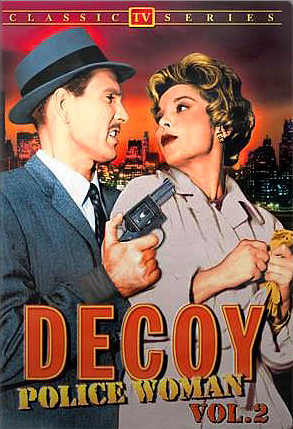 While Decoy focuses on a female police officer as the shows main character, she appears to be placed undercover in a “conventional woman’s job” in the episode we viewed. Beverly Garland plays Casey Jones, a police officer often sent undercover to crack cases from the inside. In the episode of Decoy we viewed in class, Casey Jones is sent undercover as a secretary for a company to investigate a recent warehouse fire. Jones realizes why she was assigned this case, by saying “the department always has a special reason for assigning a female policewoman to a case.” While working undercover, Jones finds herself constantly being hit on by what appears to be all her male coworkers except her boss, Mr. Risco. Since Mr. Risco knows the true reason why Jones is there, his talks with her are all business and have a distinct separation between the two individuals compared to the rest of the male coworkers. Jones utilizes her placement as a secretary to become closer to the female coworkers, because they all appear to work within a few feet of each other. She finds herself working together with what appears to be the case’s prime suspect, Michelle, who was a former patient at a mental hospital and worked late the night of the fire. Jones takes a different approach with the men in the workplace, mainly using her good looks to uncover evidence. This is especially presented in the latter part of the show at the company’s party when Jones takes Joe, a male coworker, into an office with a bottle of alcohol and ends up getting cracking the case. 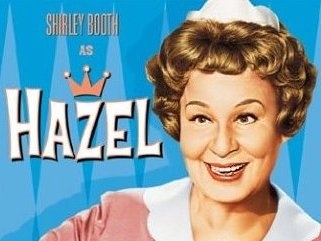 Shirley Booth plays Hazel Burke, a maid for an upper class household in the show Hazel. In the show, Hazel talks with her friend Laura about Laura’s troubles with finding a man and the two decide to sign up for a class at the local school to discover their true personalities. In the class, they are taught to constantly give compliments, which leads to Hazel finding herself in sticky situations at work. These situations include: an encounter with Mr. Baxter’s cousin, which results in Mr. B giving his freeloading cousin money; Mrs. Baxter losing a job opportunity; The Baxter’s son getting into a fight at school; and the Thompson’s gardener trying to court Hazel, rather than Laura. In this show, there is a distinct difference in dialogue which is a key element in determining class. Hazel has clear mispronunciations in her speech, which automatically makes viewers associate her with a lower class; Mrs. Baxter’s speech is clear and precise which draws viewers to the assumption that she is of higher class; and Mrs. Osborne speaks with a snobby, drawn out accent which is almost stereotypical of someone of a wealthier class. I noticed while watching Hazel, especially the scene where Mrs. Baxter is in the parking lot talking to Mrs. Osborne, that all of the vehicles used in this show were Fords (especially Thunderbirds for some reason). After doing a little research, I found that the show was sponsored by the Ford Motor Company. This fits in perfectly with Mittel’s piece, as well as the Hilmes book. The sponsorship model has changed from that period of time, but back then there weren’t as many advertisements and commercials and there was much more product placement. So, like the TV show Dragnet, where the main character smokes Chesterfield cigarettes exclusively; Ford vehicles are exclusively used in Hazel.